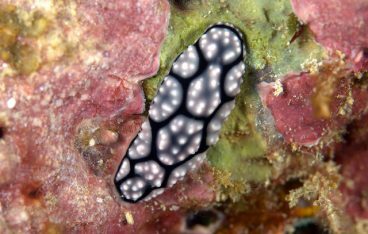 This is a species of Phyllidiella. Unfortunately there are a group of species which tend to merge from one to another. 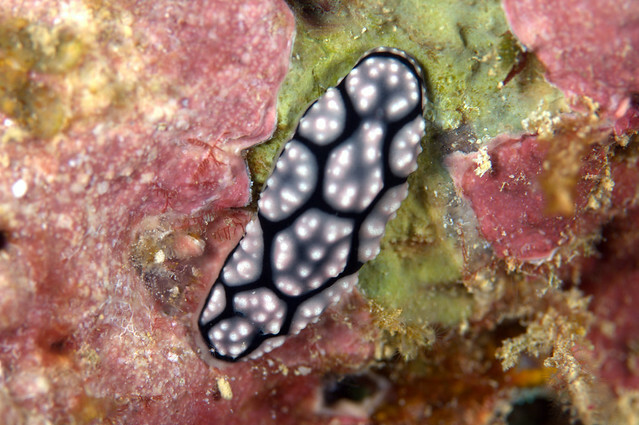 This could be a form of the very common Phyllidiella pustulosa or possibly Phyllidiella lizae. From the distinctive black X mark on the mantle, I think this is P. lizae, a view supported by the tubercles which are considered as ‘single’ rather than ‘compound’ in this species. One sure way to differentiate them is that in P. pustulosa the rhinophores are black, while in P. lizae, there are three bands – an apical black one, then a pink central band, and a white basal one, Unfortunately in your photo the rhinophores are partly contracted so this detail is not available. I suspect this is Phyllidiella lizae but I can’t be 100% sure.